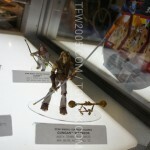 A quick look at some of the Star Wars Vintage Collection figures at San Diego Comic-Con 2012. Since this is only preview night, the full Star Wars display is not yet setup. A lot more is sure to come as the show goes on.